It's not always as easy as it sounds is it. So it should come as no surprise that being able to concisely articulate the purpose, audience, vision and goals of a project is crucial. Without these pillars, everything we put into our work suffers from a distinct lack of foundation; risking collapse under even the slightest interrogative gust of wind. If digital agencies and organisations alike were more vigorous in ensuring every project was bound to them, they would likely see many more successful outcomes. 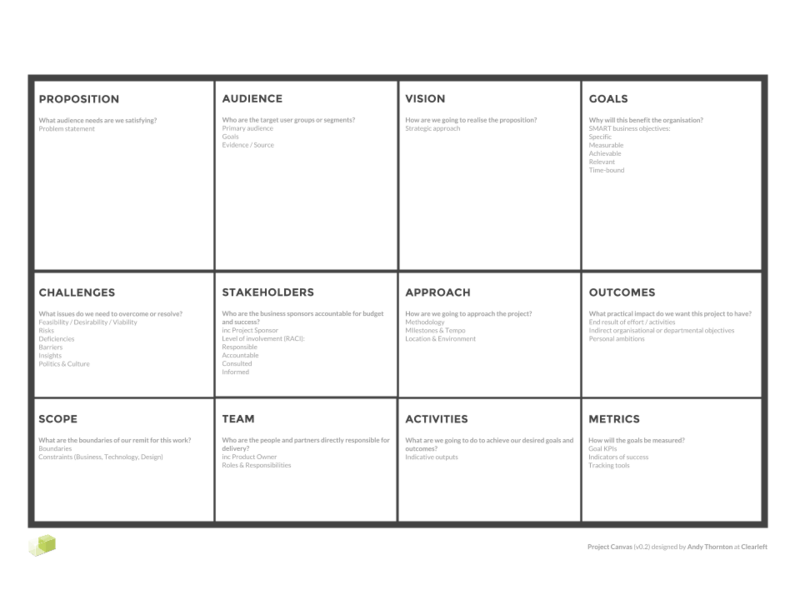 It was with this in mind that I’ve recently been experimenting with a Project Canvas as a means of making these details as explicit as possible at the start of a project. Existing solutions I’ve used previously always felt to have lacked the appropriate focus: Either too lofty in scale or scope to be practical (Stand up Business Model Canvas) or too granular and managerial to convey a higher purpose (See, well… every other project canvas). Nothing is worse than trying to work from someone else's understanding of the brief. A cacophony of disparate, overlapping, ambiguous kick-off meetings with Account Managers, Product Owners, Project Managers, Creative Directors, all giving their own nuanced (and in many instances, completely alternate) focus on the undertaking at hand. Aligning the team and baselining knowledge. It’s painfully easy to fall into the trap of making assumptions about pre-existing knowledge when onboarding new team members and stakeholders onto a project. Getting everyone on the same page quickly, with a common, shared and definitive point of reference can help refocus direction when required. The only thing you know for certain at the start of a project is that you know absolutely nothing. So a simple and transparent way to understand the lay of the land is essential. Having the confidence to ask (and make a plan on how to answer) pertinent and practical questions can make all the difference. The most important aspect of any project is the meaning behind it. Without a motivation that provides objective rationale to otherwise subjective design decisions, everything can be made instantly malleable by the fickle and transient whims of high ranking Swoop-n-Poopers. It's worth pointing out that Project Canvases are by no means a revolutionary approach. There are already an over-abundance of similar tools and techniques readily available. 2015 has almost certainly hit peak canvas, with colleagues around the office glazing over merely at mention of the format. It’s summative, avoiding unnecessary detail. As a single sheet with constrained proportions it can provide a useful 'at a glance' overview. It’s visible and tangible. Unlike a written document, hidden away on a project folder or Basecamp, it’s easy to print or write on a wall for all to see. It’s relational. When done well, it helps make relationships between information explicit, by virtue of where it is placed spacially and its proximity to neighbouring information. The draft canvas I’ve been experimenting with is laid out so that the rows are tailored to differing levels of strategic detail (the ‘Altitude’), and columns to the focus of the information required (the ‘Pillars’). The three rows from top to bottom provide an appropriate level of detail for the various stakeholders and team members who will be engaged on the project. The intention being that c-suite bigwigs, project sponsors, account managers and anyone removed from the day-to-day specifics of the project can quickly scan across the top of the canvas to gain a strategic overview. Similarly, project managers, data analysts and tech partners seeking detail on the practical mechanics can focus on the bottom instead. This is the projects ultimate raison d’être, and one unfortunately all too often overlooked. When completing this it can be quite useful to do so as an individual exercise, by asking all participants to write what they believe the proposition to be, and then sharing with the group to discuss and hopefully reconcile (another day if necessary). Where does the project start and end? The points of crossover with other teams or disciplines are often gaps assumptions fall into. These need to be made explicit. A responsibility assignment technique such as RACI (indicating who is Responsible, Accountable, Consulted or Informed) is useful here to understand the nuances of everyones role, particularly on larger projects that have a complex mix of stakeholders. Ensure you identify the project sponsor. They’re the one ultimately paying your salary, patting you on the back or pulling the plug. It’s important to get this down into a single concise statement wherever possible. Similar to the Proposition, it can be useful to complete as both an individual then a group exercise to flush out any issues with misalignment. It doesn’t need to be resolved here and now, but the sooner the better. You obviously don’t want this changing half way through. Be clear on the methodology. Identify any key milestones and the tempo of demos, playbacks or presentations with the rest of the team or key stakeholders. Tempo injects confidence in those interacting with the process. Also don’t forget to flag any specific location or environment needs that would otherwise all too easily be assumed as inconsequential ’business as usual’. These should be the core business objectives of the project (such as acquisition, retention, etc). If you can’t measure it, how will you know if the project has been a success? Setting objectives which are SMART is useful, so aim to make every goal Specific, Measurable, Achievable, Relevant and Time-bound. If you’re interested in more details regarding how to facilitate a Project Canvas session, you can find an extended version of this article on my website.